Monica shares her homemade chestnut pasta dough recipe, using Italian chestnut flour (farina di castagna), which is finely ground and full of flavour. I don’t get to see my sister, Stephanie, very often, maybe once per year if I’m lucky. So when we do get together it almost always involves an extended adventure, usually in the form of a road trip. One year it was New Orleans, another year, the Pacific Coast Highway. In November 2010, the road took us to Italy for a long, mostly leisurely drive from Rome to Bologna over the course of ten days, taking in as much as we could along the way. One of our stopping points was Pian di Marte, a farmhouse-style agriturismo in the Umbria countryside where we had one of the best meals of our lives. In fact, it was our first meal outside of Rome and we hadn’t yet gotten used to the whole course-after-course-after-course thing that Italy is known for. That pasta was merely a “first” course was unknown to us (particularly as we’re vegetarians so used to pasta being the main event). So at Pian di Marte, when we received our pasta course - homemade chestnut pasta with pine nuts, butter, rosemary and cavolo nero - we really went to town. And it was easy going because the dish was incredible. 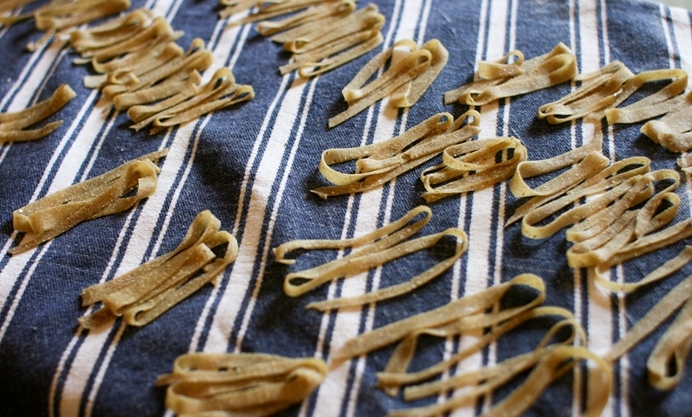 The pasta, made with chestnut flour, was hearty, nutty and unlike any pasta we’d had before. I’m not one for “whole wheat” or “spelt” pastas - they’re usually gritty and fall apart. But this chestnut pasta stood on its own and was a perfect match for the earthy rosemary and kale. Served alongside local cheeses and homemade bread, I don’t deny that we were in carbohydrate heaven, and we almost didn’t mind that we left little room for the three surprise courses to follow. The pasta was the stuff of instant legend. 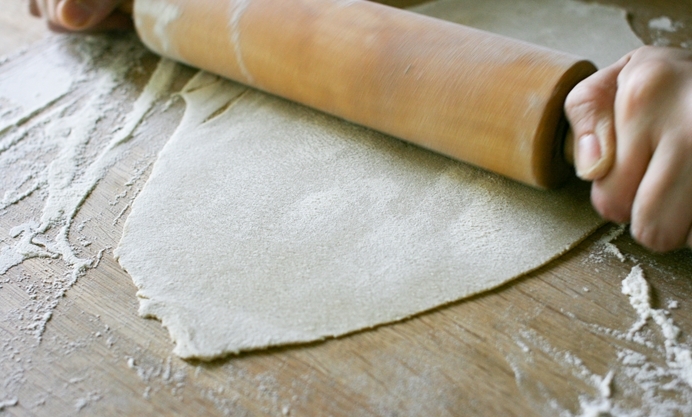 The secret, we found, is in the flour. Look for Italian chestnut flour (farina di castagna) which is finely ground and suitable for pasta making. 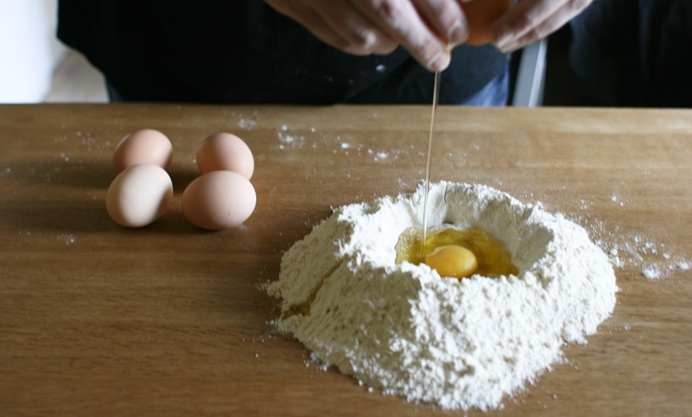 A pasta maker makes things easy, but you don’t need one - we made this by rolling out the dough with a rolling pin as thinly as possible, and then slicing into ribbons with a pizza wheel. The dough is versatile, and makes delicious spinach and ricotta ravioli. But don’t go too crazy - you don’t want to overpower the great flavour of the pasta. 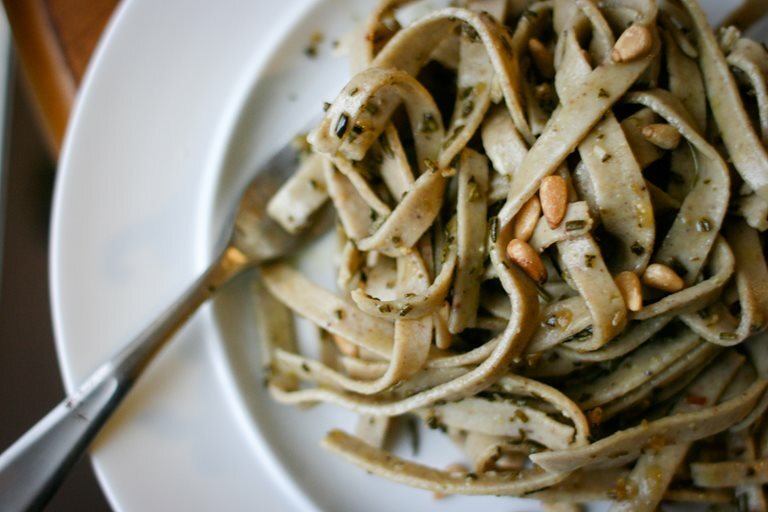 Our favourite way with this pasta, in the Pian di Marte style, is to serve it simply with some lightly sautéed garlic and rosemary, a glug of good olive oil and a sprinkle of toasted pine nuts. This recipe makes quite a lot of pasta but you can easily dry most of it and keep it on hand for the coming weeks.